Sir David Hempleman-Adams is one of the South West's best known adventurers, he was born in Swindon but grew-up in Stoney Littleton, near Bath, and now lives in Box. At the end of the 70s he achieved some fine mountaineering ascents but in 1984 began his long love affair with the Arctic by completing a solo, unsupported expedition to the Magnetic North Pole. Since then he has made some thirty Arctic expeditions and has reached the various Poles a record 14 times. In addition, he has successfully achieved some hot-air balloon challenges, including becoming the first person to cross the Atlantic Ocean in an open wicker basket rozier balloon, in 2003. In September 2009 he broke the endurance record for a flight using the smallest man-carrying helium balloon by flying 200 miles from Butler, Missouri, to Cherokee, Oklahoma, in 14 hours and 15 minutes using the class AA-01 balloon; the previous record of an eight hour, 12 minutes flight had stood since 1983. 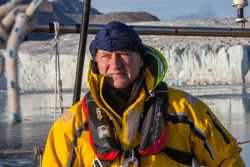 In summer 2016 The Polar Ocean Challenge team, led by Sir David, a veteran polar region adventurer, successfully circumnavigated the North Pole in a small aluminium sailing boat. Departing from Bristol, via Murmansk and back via Greenland and an Atlantic crossing, they endured freezing conditions, met with more than one hurricane, avoided collisions with icebergs, got stuck in the ice on more than one occasion, and encountered various wildlife including a polar bear.